Majorca enjoys a wonderfully strategic position, ease of access and year-round sunshine which have made it a long-time draw for tourists and the island offers such a welcome that once you’ve been, you’ll be looking to get back to this beautiful Mediterranean island. Irish holidaymakers are well known in the sunny climes of Majorca, or Mallorca as it is known locally, with destinations like Santa Ponsa, Alcudia and Magaluf high on the visited list for many. But there is another side to Majorca that operates at a different speed and it is ideal for golfers. Majorca is the largest island in the Ballearics which is an island group just off the coast of Spain which have been an autonomous region of Spain since the early 1980’s. The Ballearic islands also include Ibiza, Menorca and Formentera but Majorca (which translates to larger island) is by far the busiest with 26.3 million tourists passing through Palma de Majorca airport in 2016. Having been invaded over the centuries by the Moors and Romans among others, the culture in Majorca is somewhat diverse, although this has been diluted of late by the tourist numbers. But don’t let that deter you as the welcome, the weather and the golf is top class. The diversity of cuisine, vast choice of accommodations, and the very relaxed atmosphere make for a wonderfully laid back trip and ultimately that’s what we’re all looking for. In all there are twenty golf courses in Majorca but for the trip that IGM took we visited Club de Golf Alcanada and arguably the jewel in the crown of Majorca golf, Son Gual. Designed by Robert Trent Jones Jnr. 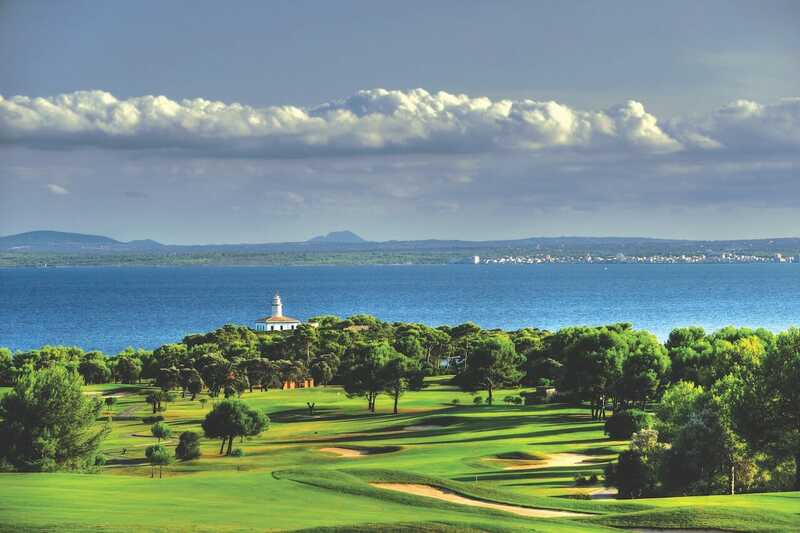 and opened in 2003 Alcanada Golf is located beside Alcudia Bay and boasts stunning vistas and a challenging 6499 metres. In typical Trent Jones style the course is littered with greenside bunkers that await the errant approach but it is the contrast between the front nine and the back nine which give the course it’s character. The front nine is arguably the more difficult with the fairways lined with mature trees and plenty of strategic thinking required off the tee. There is great use of the natural terrain and some wonderfully quirky holes which cause you to stop and catch your breath and the designer has made great use of the topography on the back nine too with significant elevation changes which lead to some pretty spectacular tee shots. The back nine sees more emphasis on positioning off the tee as the number of trees is drastically reduced but it is no less challenging as the well protected greens provide ample cause for concern! Son Gual provides a very different challenge to Alcanada. Where Alcanada had trees, Son Gual has water and where Alcanada allowed you to run your ball into the green Son Gual asks for an altogether different style of shot on every hole. Opened in 2007 Son Gual has earned a reputation as one of the best (if not THE best) golf course in Majorca. Visually it has absolutely everything you could wish for in a golf course, varying design, doglegs, elevation changes, great use of the natural terrain and greens which are a challenge but not impossible. But it is in the use of water where Son Gual comes into its own as it’s a factor on the majority of holes in one form or another. But it isn’t all about water here, the designers have taken great pains to ensure a solid design which will prove a robust test for all levels of golfer but will also provide a gentler, less stressful option for the average player. Multiple teeing options and generous bail-out areas are to be found on all holes and while the course can appear visually intimidating, it is really very playable and enjoyable once you commit to your shot and there are a few stand-out memorable holes here such as the 18th with its streams and lakes guarding the fairway and green and all the par 3’s are superb, with particular emphasis on the 9th and 15th. 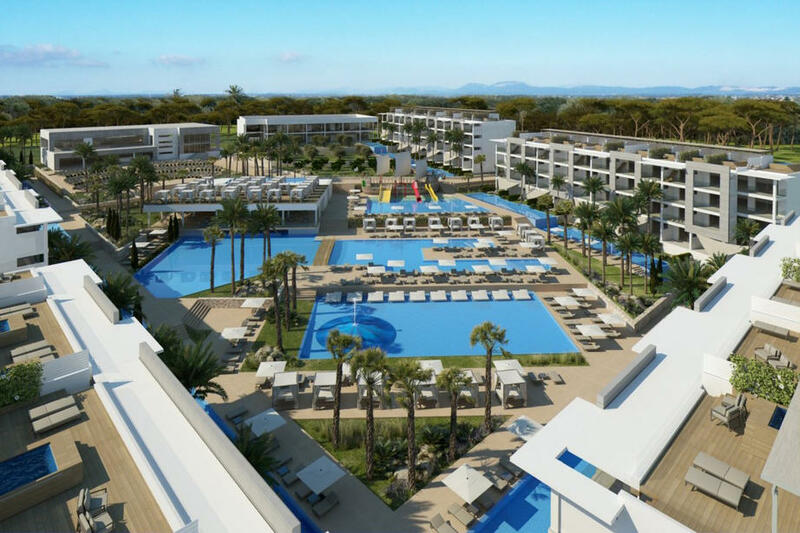 If you’re looking for a recommendation for a nice hotel then the 5-Star Zafiro Palace Alcudia is where IGM were placed and it was ideal. The resort caters for the whole family and the rooms are luxurious, spacious and the views over the complex from the balcony are superb. They have a huge array of dining options available with a buffet breakfast which caters for your every desire and then a choice of restaurants for dinner including the buffet style Market Restaurant, the Italian style Portico Restaurant, El Olivo offers Mediterranean and Mallorcan specialities, there is the Tastes & Sushi Bar and they also have La Veranda which is a speciality grill restaurant. With easy access with Ryanair from Dublin and a Clubs to Hire shop at Palma de Majorca airport it couldn’t be easier (or cheaper) to get there. Leave your clubs at home, book a top of the line rental set from Clubs to Hire and collect them at the airport when you land and you’re all set for what will be a truly memorable golf experience. So hop online and check out the offers. Modern junior suite in double occupancy. Single Use Supplement +30 EUR pppn. Single Use Supplement: +30 EUR.